Centon is a Chinese camera, lens and accessory brand. Centon cameras are mostly clones of older Japanese models - perhaps using the original, obsolete tooling - but some in newer materials. In the UK Centon was the name given to cameras and accessories sold by the Jessops chain of retailers. 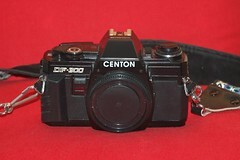 Centon K100 35mm SLR Not based on any camera but a design based on the Cosina CT-1 chassis. Definitely nothing like the Pentax K1000 which many people say this camera is based on. The CT-1 chassis was used for many budget cameras so the K100 has similarities to many other models as well as a number of shared parts. Other models include the Yashica FX-3, Nikon FM-10 and the Olympus OM2000 but there were many others.